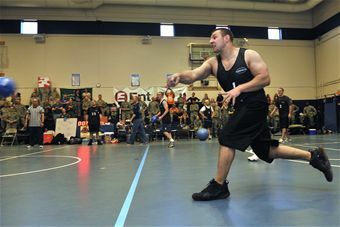 Shriever Air Force Base airmen set out to smash the world record for the largest dodgeball marathon and they think they did it. But it will be up to the good people of the Guinness Book of World Records to deem it so. About twenty airmen from the base attempted to break the record as a cool way to raise money for the Air Force Assistance Fund, though they had the support of plenty of their fellow airmen to get the job done. To break the record they had to play dodgeball for more than 31 hours, so they set their sights on a goal of playing for 40 hours. Learn who the current record holder are and what else the airmen had to do to beat them here. On March 22 and 23, it was the Red Team versus the Black Team and they battled to the 40-hour finish by playing 859 games of dodgeball, according to a press release from Schriever’s 50th Space Wing Public Affairs. The Black Team won the marathon with 440 wins to the Black Team’s 419. But it looks like airmen who might need the assistance fund will be the real winners. The marathon raised more than $1,000 thanks to cash donations and pledged funds. Col. James Ross, 50th Space Wing commander, commended the players for their hard work and the wing for rallying in support of the event. Continuous video of the event will be sent to the Guinness Book of World Records for validation before Schriever is officially awarded the record, according to the press release.